Single rhizomes will work well when planted in the wettest parts of the planting season or where supplemental watering is available. Good drainage is imperative as single rhizomes normally do not have any feeder root to take up moisture. If planting in moisture saturated soil in cooler temperatures add sand around the rhizomes when planting. You may wish to hold your rhizomes in the shipping bag in a cool, dark place until your planting area dries out a bit. Best to plant when soils are wet, but warmth is available to grow feeder root. You will need to determine when it’s best to plant as per your forecasts. The roots will hold fine in storage so long as they are cool, left on the dry side but not bone dry, and kept from sunlight and heat. You can expect 4-6′ of height average the first year from single rhizomes. They will produce a smaller plant than our larger divisons, but may be planted closer together. A rate of 8”- 1′ apart is recommended. It is a more economical way to plant, but will take longer to establish. Each division will differ in size. ½ gal divisions will roughly fit in the palm of your hand. 1 gal size divisions are a larger handful. Each is sized to fit a trade size pot, ½ or 1 gal size. A trade size 1 gallon pot is not the size of a one gallon milk jug. A trade size gallon post is about 6 x 7, and if the roots were planted there would still be room for the soil. Divisions will have 2 or more (sometimes many small) rhizomes attached to one another. They may also have some feeder root attached. Divisions are graded by root mass and weight, not by looks. So may have only 2 rhizomes, but they will be larger than single rhizomes in both circumference and length. 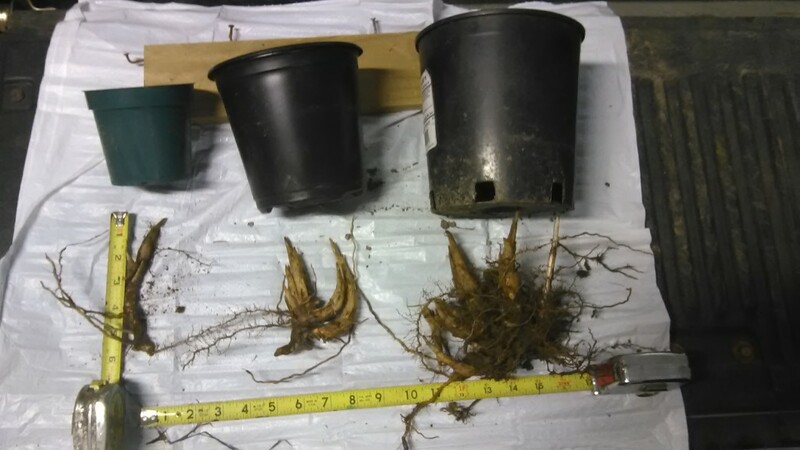 Rhizomes are similar to bulbs in that they store up the nutrient made through the growing season and are ready to grow a new plant the following growing season. Making a plant bare root disturbs the feeder root system, the finer roots of the plant. These will re grow in spring and fertilization the first season will help these establish. Once plants are established there is little need to fertilize. Bare root divisions greatly reduce the shipping costs of this plant and is not detrimental to the plant itself. Plants are packed in plastic bags with moistened peat moss. Peat moss is much lighter weight than normal soils and helps the plant ship well and allows the plant to be held in this fashion for several weeks if needed before planting. To keep plants in a more dormant state, place in a area out of sunlight and heat. Smaller shipments can be held in the refrigerator, so long as the bag is tightly shut to keep moisture in. When holding shipments for later planting always check the moisture level of the plants making sure they are slightly damp, not sopping wet. Too wet conditions will cause the woody roots to rot or mold. 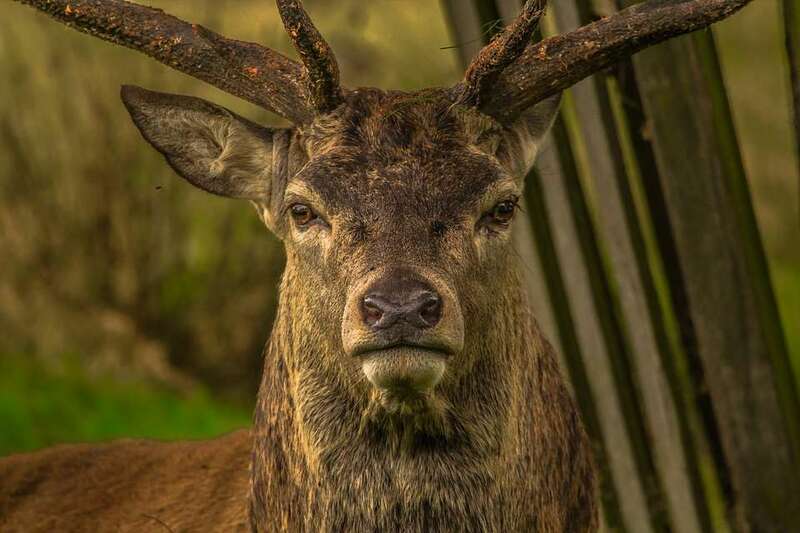 Read one hunter’s story here. Miscanthus has a harvest window between fall and spring, harvest at your convenience. Left standing through the winter the plant dries to 15% moisture level and needs no further drying as corn and wood do, to burn. The plant requires no pesticides or fertilizer, this is due to the fact that they simply store up the nutrients that they manufacture (much like a bulb does). It will overtake weeds once established and weed control to establish simply uses turf type herbicides. This grass is the most cost effective to pellitize, folks are making their own pellets and heating their homes and business. The grass can be stacked and stored in the field for ease of storage. It will not rot and is the best bedding material known as well. Miscanthus can be co-fired with existing coal boilers. It is being used in ethanol production and grants of up to 75% of seeding fields are available through the federal government. You must be within a short distance of a plant set up to process this type of ethanol to qualify. Up to $45 a ton as added payment to the farmer when delivered to one of these facilities is available through the B-CAP grants the government has set up for alternative fuel production. Miscanthus Giganteus is a sterile plant, non invasive, but only grows from root divisions. It can be grown on marginal land, as it uses its own nutrients that have been manufactured by the plant. It is a vigorous plant, roughly quadrupling in a years time! Hardy zones 4-9, it is cold hardy. This plant likes lots of water to become established, but thereafter is quite drought tolerant. When field planting one should plan on having adequate irrigation for the first year. It does not grow well in waterlogged sites and its woody roots can rot in these conditions. Harvested as hay is, it is cut and baled. 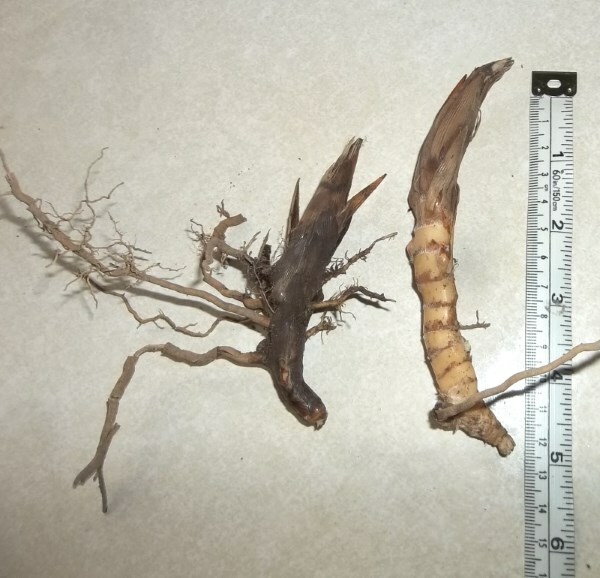 Plant single rhizomes 1' apart, ½ gal divisions 1.5 -2' apart, 1 gal divisions 2-3' apart. At this planting rate grass should touch each other in 3 years time. They may be planted closer, but the root need room to grow and you may be overspending as the roots will have little room to spread. If your space and budget allow, extra rows with staggered spacing will give you a fuller look sooner and still give the grass room to spread. Expect first year growth of 3-6' in height on single rhizomes, 5-8' of height on ½ gal divisions, 6-10' of height on 1 gal divisions. All plants will appear somewhat sparse the first year and may have only 1-3 stems per plant. Plant divisions in well worked soil with 2-4" of dirt covering them. Cover and mulch. You may choose to fertilize the first year with basic 12-12-12 fertilizer or a product like miracle grow. After the first year fertilization does not seem to speed up growth as all the plant needs is stored in the root system after a years growth. This grass likes lot of water and should have supplemental water for the first season to become established. Plan to divide your plants every 3-5 years if you desire a clumped effect in the landscape. If left for too many years your clump will become very large and be hard to lift manually. Generally the whole clump is lifted as the roots become very woody and entangled and cannot be cut apart by simply shoveling a portion out. A saw or ax is helpful in dividing the clump, we use an electric saws all. Even if you wish for a full field like planting, we feel dividing off of your clumps helps rejuvenate the plant as the roots tend to choke the center of the plant out. It will continue to grow outwards, but giving the plant more room to grow all around seems to be beneficial to the plant and will give you more roots to fill in other areas if desired.